Morocco lies at the north-western corner of Africa, with coasts on the Mediterranean Sea and the Atlantic Ocean. Sea defines its western and northern edges; its land borders are contested. The frontier with Algeria, to the east, is largely fixed, except for a short segment in south-eastern Morocco, stretching to the oasis of Figuig, but Moroccan sovereignty over the territory of Western Sahara, in the south, is widely questioned. 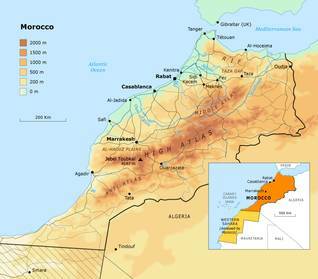 This territory, which was until 1975 the colony of Spanish Sahara, borders Algeria and Mauritania. Morocco’s land boundaries total 2,018 kilometres, and it has a coastline (both Atlantic and Mediterranean) of 1,835 kilometres. On the northern coast, there are short land boundaries with the Spanish enclave cities of Ceuta (6.3 kilometres) and Melilla (9.6 kilometres). Spain also controls three offshore territories that Morocco considers part of its territory: the Chafarinas Islands in the east (close to the Algerian frontier), Peñon de Alhucemas, and the Peñon de Vélez de la Gomera further to the west, between Melilla and Ceuta. The Western Sahara has a land surface of 266,000 square kilometres, slightly larger than Great Britain. It has coastline of 1,110 kilometres and land borders of 2,046 kilometres. Morocco consists of a central spine of mountains flanked by deserts and plains. The Atlas chain is really four separate ranges. In the far south, the Anti-Atlas marks the beginning of the Sahara proper and cuts off the Morocco of cities and settled agriculture from the Sahara desert. These mountains are low – only one peak rises above 3,000 metres – and extremely dry, with annual precipitation usually less than 200 millimetres. The next range to the north is the High Atlas, which is much higher. Even in summer, there can still be snow on some peaks. 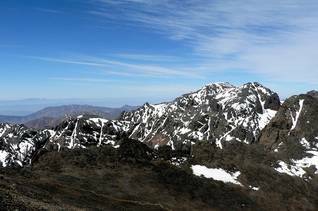 Jabal Toubkal rises to 4,165 metres. The High Atlas dominates the city of Marrakesh and the fertile plain of al-Haouz and then turns north-east and then almost due east, skirting Fez to the south, and joins the Middle Atlas range, which extends into Algeria. To the north of Fez another, smaller chain, the Rif, runs along the Mediterranean coast and ends near the modern city of Tétouan in the Jebala massif. The narrow corridor that lies between the Middle Atlas and the Rif is the Taza Gap, which links the Atlantic plains with Algeria and the rest of northern Africa. These mountains enclose the Atlantic plains like a wall and catch the rainfall brought in from the Atlantic by the prevailing westerly winds. There can be as much as 2,000 millimetres a year in the Western Rif, and the High Atlas around Marrakesh gets around 800 millimetres, but rainfall is irregular: there are cyclical droughts and wetter periods, which can lead to serious flooding. The rain that falls on the mountains flows back to the sea in rivers filled with winter rain and melting snow in the spring. These rivers water the plains. Nearly all the main rivers run west, into the Atlantic; only one, the Moulouya, flows north, into the Mediterranean. All of them are small, and the amount of water in them varies: the Sebou and the Oum al-Rbia carry water most of the year, but smaller rivers such as the Tensift, Bou Regreg, and Loukkos are sluggish in summer. The rivers cannot be used for transportation, and land routes have historically followed the gaps through the mountains and the easier routes across the plains. Moroccan cities have consequently been situated inland, in order to command these passages through the mountains. The Atlantic coast was economically marginalized, partly because European enclaves occupied some of the best harbours (in the early modern period) and partly for lack of Atlantic trading partners. The Mediterranean coastline is cut off from the rest of Morocco by the Rif Mountains and has many small coves but no large estuaries. Two good Mediterranean harbours, Ceuta and Melilla, have been the sites of Spanish enclave cities since the late Middle Ages. In 1996, the FAO reported that Morocco had the highest plant diversity in North Africa, with 4,500 species. The face of Morocco has changed enormously since then. The douars, the tent villages of transhumant herders who dominated the Atlantic plain, have disappeared, although the flocks of cattle and sheep have not. Farming is much more intensive now, and the diversity of fauna has diminished dramatically. The rapid increase in the human population has put enormous pressure on the land, causing rapid degradation of the natural vegetation. In 2010, 39 percent of the population was living on degraded land. In 1994, it was estimated that 1,000-1,500 hectares of forest was lost to clearance each year. Overgrazing, particularly by goats, and the intensification of farming in marginal areas in the illegal cultivation of cannabis have both caused problems. Illegal clearing of forest has been another serious problem, for both valuable forest products, such as sandarac wood, and scrub wood used for fires. In 1910 the forests of the Mamora on the west coast covered 130,000 hectares but had been reduced to around 55,000 hectares by the late 1990s. This has been going on a long time: Edward Drummond-Hay’s son, John, complained in the 1840s that British commercial agents buying huge quantities of cork for export had devastated the forest. The great seasonal wetland of Merja Ras Douara, on the northh-west coast, was 40 kilometres long in the 1920s but was estimated at only 10 hectares in 1994, and the vast array of birdlife it once supported has greatly diminished. Yet very heavy rain in late November 2002 caused flash-flooding, and the Merja Ras Doura reappeared again. Sixty people died in the flooding. Species lost range from large mammals to insects and fish. 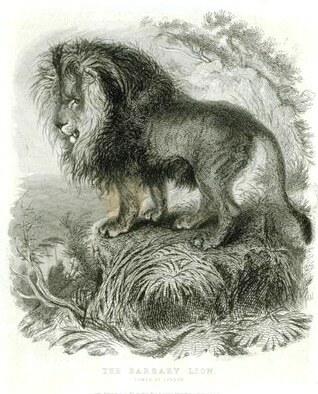 The big cats have suffered considerably, as wild lands have dwindled. 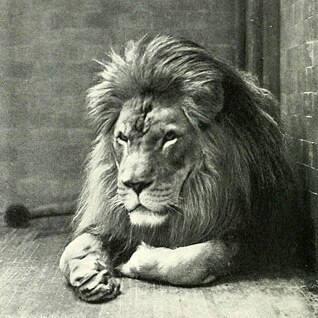 Some have been permanently lost, such the Barbary lion, which appears to be extinct: the last wild one was shot in 1920 (in the 1970s specimens were identified in Temara Zoo in Rabat that appeared to be examples of the species, but none of them was flawless). The cheetah is a more recent loss: until the mid-20th century, it was still found in the Atlas Mountains (in 1976 one was captured in the Western Sahara and given to the Algiers zoo). Others may have disappeared completely or may survive in very small numbers, such as the serval, of which relict populations may exist in humid scrub and mixed woodlands in the Atlas Mountains, or the leopard, very small populations of which still appear to exist. 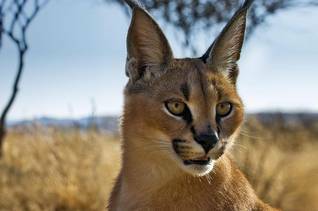 One cat species seems to have thrived: the caracal, which is widely distributed across northern Africa in forests, semi-arid woodlands, and Saharan mountain ranges. The only region where it is not found is the desert itself. It is tough and adaptable and can apparently get the moisture it needs from its prey, the sort of small mammals and domestic livestock that frequent human settlements. The big cats are forest and mountain animals, but overgrazing of vegetation elsewhere has reduced the richness of plant species and in turn, the number and species of butterflies that feed on them. Among fish, the shebbel is now extinct in Morocco, although its disappearance is recent: it was featured in a Moroccan recipe book published in 1974 and was reported to have spawned as recently as 1990. Official reports in 2008 classified as threatened 47 species of fish, 18 species of mammal, and 28 species of plants. 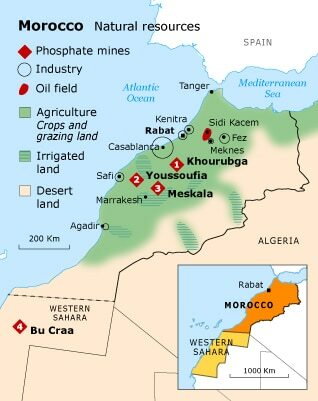 Morocco is the world’s largest exporter and third largest producer of phosphate rock, a critical raw material for fertilizer: it is estimated that one ton of phosphate, the basis of fertilizer and other chemical products, is needed to produce 130 tons of grain. Morocco produces just over 14 percent of the world’s annual production (27 million metric tonnes in 2011 out of a world total of 191 million mt), but the only two larger producers, China and the United States, use most of their production themselves. Even more importantly, Morocco has over 70 percent of proven world reserves: 50 billion mt of a total of 71 billion mt (2011). The Office Chérifien des Phosphates (OCP), the monopoly producer, was set up by the French Protectorate authorities in 1920 to begin production at Khouribga. By 1930 it was already providing 17 percent of state revenue. The OCP became a limited company in 2008, by far the largest in Morocco. Today, a substantial part of the production comes from the Bu Craa mine in the Western Sahara, providing another reason for retaining that territory, but the main reserves at those at Khouribga, Youssoufia, and Meskala. One of Morocco’s major resources is its land: Morocco is a major producer of food. In 2010, food production had increased by 27 percent over the average in 2004-2006, but Morocco is a hard country to farm, and in 2009 arable land (land under temporary crops, and land under market or kitchen gardens) made up only 18 percent of the total land area, and only 4.6 percent of total irrigated agricultural land. Forest covered 11.5 percent of the land area in 2010; the rest is pasture and unused land. The development of agriculture is limited by the availability of water, and a campaign of large-scale dam building began in the Protectorate period and continued after independence. Between the 1960s and the end of the 1990s, 92 large dams were built, providing water for irrigation and drinking, control of flooding, and as a source of hydroelectric power. Not all these dams produced the expected results: they did not always deliver the projected amount of irrigation and denied water use to former downstream agricultural users. But the dam projects continue. The 2009 national budget set aside USD 300 million to build five large new dams. The conservation of wildlife and the needs of the human population are not necessarily in conflict. Both are adversely affected by decreased supplies of firewood and timber and by soil erosion. Preserving the balance between human activity and environmental conservation became one of the first concerns of the Protectorate administration in the 1910s, which focused its efforts especially on forest cover. There are now nine national parks administered by the Haut Commissariat aux Eaux et Forêts et à la Lutte Contre la Désertification, which administers forest conservation, water conservation, the campaign against desertification, and the management of sports-shooting and fishing. • Parc National de Toubkal was the first national park in Morocco, created in 1942 in the central High Atlas and including the highest mountain in Morocco, Jabal Toubkal. It covers 38,000 hectares and receives about 40,000 visitors a year. 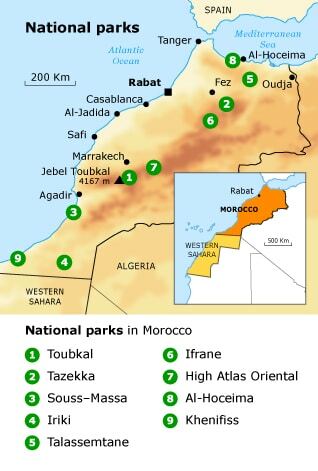 • Parc National de Tazekka was created in 1950 and extended in 2004 to consist of 13,737 hectares south-east of Taza. It includes a large cedar forest, and its animal life includes 83 species of birds and populations of moufflon, wild boar, and jackals. • The Parc National de Souss-Massa (33,800 ha) was created in 1991, in southern Morocco, between Agadir and Sidi Ifni on the Atlantic coast and including the estuaries of the Oued Souss and the Oued Massa. It is a particularly important ornithological site. There are captive-breeding programmes for various species of oryx and gazelle within the park. Visitor facilities have been built to cater for growing numbers of tourists. • Parc National d’Iriqui (133,000 ha) was created in 1994 in the Drâa region of the far south. Its desert environment is important for moufflons, hyenas, and a large number of reptile species and is a centre for migrating birds. There are plans to reintroduce the oryx and the red-throated ostrich. • Parc National de Talassemtane (58,950 hectares) was created in 2004, in the eastern Rif mountains. It is noted for its pine forest and provides an environment for over 100 species of birds, including the royal eagle. • Parc National d’Ifrane (51,800 hectares) was created in 2004 in the Middle Atlas and is noted for its lakes and stands of Atlas cedars. There are large colonies of macaques, and it is a centre for migratory birds. 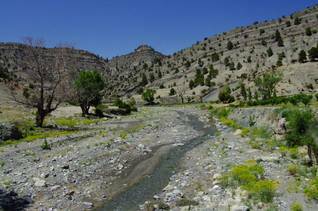 • Parc National du Haut Atlas Oriental (55,250 hectares) was created in 2004 in the High Atlas and stretches from Lake Isli in the west to Jabal Aberdouz in the east. The vegetation comprises forests of cedar and evergreen oak and large areas of steppe landscape above 3,000 metres, and animal life includes magot monkeys (Barbary macaques) and wild boar. • Parc National d’al-Hoceima was created in 2004 and has an area of 48,460 hectares, of which 19,000 are in a marine zone. It includes an area of rocky coast with high cliffs. There are important stands of thuja, Aleppo pine, lentisc, carob, and evergreen oak, among other trees. There are endangered species of dolphin off shore. • Parc National de Khenifiss (185,600 hectares) was created in 2006, on the south-western coast, between Tan-tan and Tarfaya. It is partly a marine park, including the only lagoon on the Saharan coast, which is an important migration stop; the onshore section consists of salt lakes (sabkhas) and a high plateau region with desert flora and fauna. Morocco is party to several international treaties including Biodiversity, Climate Change, Desertification, Endangered Species, Hazardous Wastes, Marine Dumping, Ozone Layer Protection, Ship Pollution, and Wetlands. Morocco ranked 105th in the 2012 Environmental Performance Index, a ranking of 132 countries established by Yale University on the basis of environmental public health and ecosystem vitality. This places it with some of the weaker performers internationally and among the Arab states: Algeria, Lebanon, and Tunisia, in the same group, all have better records and the next higher group (‘modest performers’) includes Egypt, Israel, the United Arab Emirates, and Saudi Arabia. In short, Morocco’s performance is poor. The costs of pollution in Morocco are high: the UNDP reported in 2011 that environmental degradation costs the equivalent of 3.7 percent of GNP, and this has especially severe effects on the populations of the most fragile regions. While 100 percent of the urban population was reported to have access to improved drinking water in 2006, the figure was only 57 percent for rural inhabitants, the lowest for any of the Arab countries in the Mediterranean basin. The percentage of the total population using improved sanitation was similarly the lowest of any of the Arab countries in the Mediterranean basin. There is substantial water pollution. As measured by biochemical oxygen demand (the amount of oxygen that bacteria in water will consume in breaking down waste), emissions of organic water pollutants are high: 73,989 kg a day in 2009, 43.5 percent of which came from the textile industry, followed by the food industry. (In comparison, Syria produced 80,444 and Jordan 29,147). There is a general shortage of water, but some areas are prone to flooding. The once great seasonal wetland of Merja Ras Douara, which has almost entirely disappeared (see Biodiversity), was flash-flooded in November 2002, and 60 people lost their lives. The Environment Ministry estimated in 2012 that the impact of air pollution represented 1.03 percent of GNP. Morocco was one of the last countries to ban completely the sale of petrol with added lead, although that process was completed by 2008. CO2 emissions in 2009 were 1.5 metric tonnes per capita (in comparison, Lebanon emitted 5 metric tonnes per capita, Syria 3.3, and Algeria 3.5). In 2000, just under 70 percent of waste collected in urban areas was organic (compared with 10 percent in France and 55 percent in Egypt). (Figures from State of the Environment and Development in the Mediterranean – 2000). To deal with these and other issues, the government adopted in 2009 the Charte nationale de l’environnement et du développement durable (National Charter for the Environment and Sustainable Development) which sought to prioritize environmental management by outlining general principles that linked the economy with a pattern of sustainable development. It strongly emphasized organizational cooperation among central government authorities, regional and provincial governments, and NGOs. Central government responsibility for the environment now falls under a super-ministry (which also includes energy, water, and mines), currently headed by a member of the Istiqlal party. The ministry has proposed both large-scale and local efforts to deal with environmental degradation. For the water problem, a campaign has been mounted to build dams and develop underground water supplies, to clean and recycle used water, to improve irrigation management, to encourage drought- resistant crops, and to impose stricter controls on water use. Rural pollution through lack of water and poor waste management was made the focus of two extensive local programmes to improve water supplies and sanitation, specifically in rural schools and mosques. Work on pollution includes a nationwide effort to combat the use of plastic bags and to collect a huge and heavily polluting backlog (160 tonnes of plastic bags were destroyed in 2010), and to clean up coastal pollution – the Mar Chica lagoon, near Nador on the Mediterranean coast, is a major project – and industrial pollution, particularly in the Casablanca region. Not all environmental threats are man-made. Two permanent problems are locust infestations, which cause great damage to crops, and earthquakes. Morocco is at the north-western edge of the summer outward migration of locusts originating in Chad. There were serious locust plagues in 1987-1989 and 2004, when swarms invaded southern Morocco and the Western Sahara, after crossing from Algeria. On that occasion, individual swarms covered between 5,000 and 30,000 hectares. Smaller swarms reached as far north as Meknes. In 2003-2004, the Moroccan government spent about USD 38.8 million on anti-locust measures, which was covered partly by aid from Spain, South Korea, Saudi Arabia, the Netherlands, the FAO, and USAID. Moroccan authorities provided pesticides to Sahel countries to try to stop the swarms from spreading. In 2012, as another plague got under way, they donated 60,000 litres of pesticides for use in Mali and Niger. Morocco is in a tectonically complex zone, with frequent moderate to strong earthquakes. These are associated with the convergence between Africa and Europe that runs through the Strait of Gibraltar. On land, there are faults in the three main mountain chains – the Rif, the Middle Atlas, and the High Atlas – which have meant a long history of earthquakes in Morocco. An article in Seismological Research Letters (2007) lists earthquakes back to 1045. 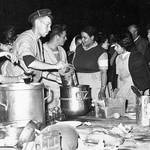 The Agadir earthquake (magnitude 5.7), on 29 February 1960, whose death toll was 12,000, was the worst ever to be recorded in Morocco. At least 35,000 people were left homeless. 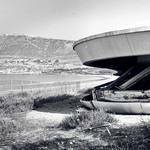 The most serious recent earthquake was in February 2004, with its epicentre in the Strait of Gibraltar and a magnitude of 6.4. The most seriously affected area was the province of al-Hoceima. Al-Hoceima city has a population of 100,000, but the worst damage was in the surrounding villages, where mud-brick buildings could not withstand a major quake. 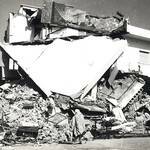 The government estimated that the earthquake killed at least 572 people, injured 427 others, and made 13,000 homeless.